Oh Belgium, with its crisps shacks and its beers! 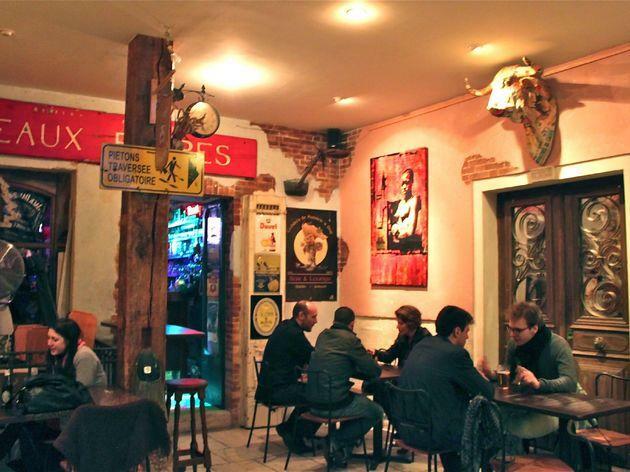 The Troll Café, hidden in a small road near the Bastille in front of Nul Bar Ailleurs, is a pub that honours the glory of barley malt and hops, well worth the stop for those weary of Amstel. The menu has 120 Belgian beer options, in all their forms: on tap, bottle, brown, white and amber. The choice is so vast that your best bet is to ask the bartenders for advice on choosing between, for example, bottles from Duvel, Chimay, Orval, Westmalle, Chouffe and even Ch’ti. For a really exceptional taste, the bartender can help you pick one of seven beers meticulously made by Trappist monks using centuries-old recipes. On tap, there are artisanal beers like Troll or Delirium Tremens. 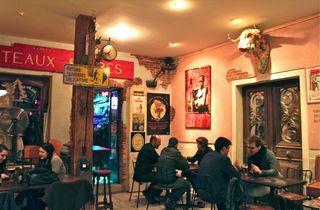 In terms of décor, vintage beer posters for Krieg, Mort Subite, and others cover the walls. The ambiance is fun without being crazy, and even on football nights you can still chill and sip your beer.